Hyde, Michelle Hazelwood. New. Trade paperback (US). Glued binding. Contains: Illustrations. Intended for a juvenile audience. New. 1937870340 BRAND NEW, GIFT QUALITY! NOT OVERSTOCKS OR MARKED UP REMAINDERS! DIRECT FROM THE PUBLISHER! |0.5. Hyde, Michelle Hazelwood. Fine. Trade paperback (US). Glued binding. Contains: Illustrations. Intended for a juvenile audience. In Stock. 100% Money Back Guarantee. Brand New, Perfect Condition, allow 4-14 business days for standard shipping. To Alaska, Hawaii, U.S. protectorate, P.O. box, and APO/FPO addresses allow 4-28 business days for Standard shipping. No expedited shipping. All orders placed with expedited shipping will be cancelled. Over 3, 000, 000 happy customers. Parents and teachers struggle frequently with children lying and it seems to be a hard habit to help them break. This fun, entertaining book has just what kids need to see the error of their ways! Levi knows tells lie, all the way from Whoppers to little "white" lies. He finds it easier to tell an untruth than face the consequences of his actions. At least he thinks it is easier. Sometimes his falsehoods do the trick but many of his friends, family, and teachers see right through most of them. That doesn't stop Levi. One day a note is sent home from his teacher and unknown to him she gives his Mom the thumb up it is on the way. Of course Levi tries to tell a fib. Mom, knowing the truth, explains to her so how damaging lying is, and one falsehood always leads to telling another, and another and another, ...... She points out all the ways lying hurts Levi. No reason is big enough to make it okay to tell one. Starting then and there he decides he will try telling the truth every time. He begins my fessing up to what REALLY happened to the teacher's note. The next day he goes to each person he has been dishonest with and admits his lies from the day before. That took courage! He is amazed at how good it made him feel and how forgiving everyone was. At the end of the book are advice and 11 thoughts and ideas to foster honesty in children. 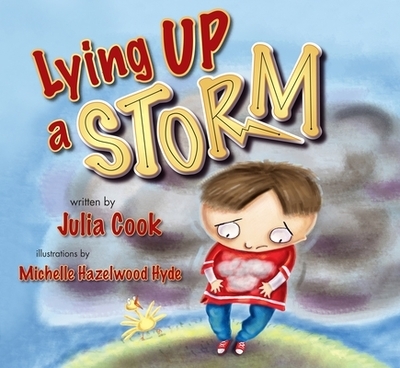 As always with Ms. Cook's books are entertaining, though provoking and present the material in a non-judgmental or threatening way to the child.